The alphabet is easy. The fourth letter is D. And it’s pretty easy to figure out a job that starts with D.
Last time, our carpenter had a mishap, and so he had to have someone check over his injury. Here is the Doctor! No, not from Doctor Who, but an actual medical doctor. So, we continue the A to Z Challenge with the letter D and The Doctor. Check out the video of me reading my story, and then I talk a bit about some of the background. If you’re interested in keeping up with the story as I release it, then please consider subscribing to my YouTube channel! I talk a lot about books, reading, writing, and even some science fiction. And let me know what you think in the comments below. Part 3 is here for my reading of Ariadne! The letter C stands for Carpenter. If you remember from my previous posts, I participated in the A to Z Challenge three years ago, and I wrote a flash fiction series based on the letters of the alphabet, each part representing a different profession. For the letter C, I chose carpenter. On my YouTube channel, I decided to read the stories out and then discuss various aspects on what was going through my mind while I was writing. Who are the characters? What’s revealed about the world and my inspiration? Well, find out in the video! If you have any comments, then please let me know down below. Oops! I missed a day. But here it is, this is part 2 of the Ariadne flash fiction series I did three years ago for the A to Z Challenge! You can see the full list of stories here. If you’d like to keep up with the videos on my YouTube channel, then please consider subscribing. And let me know what you thought about this part! No April Fools today. I actually am going to do a blog post every day this month. Sounds like the old days! Starting today, I’m sort of doing the A to Z Challenge, but in video form. The first part of the flash fiction series I did three years ago is up! It’s called “The Artist.” Enjoy! I’ll be posting a new video every day, and if you’d like to keep up to date on YouTube, you can subscribe to my channel. 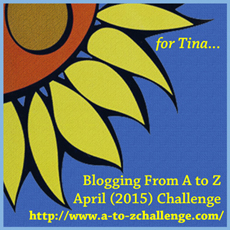 A to Z Challenge Again? Three years ago, I participated in the A to Z Challenge. This year, I’m sort of participating, but not really. First of all, I’m not signed up for it. But secondly, this is a blogging challenge, and what I’m doing isn’t blogging. But I am informing you of it on my blog. Instead, I am doing VEDA, Vlog Every Day in April. And it is very much related to the A to Z Challenge I did three years ago. You see, three years ago, I wrote a 26 part series of flash fiction stories based on my world of Ariadne. This year, I’m reading them out and talking about the inspirations, backgrounds, and characters involved in each part. I’m doing this all on video. Below is my announcement video. Every day, I will be posting each video on here, and you can leave your comments on this blog or on the video itself, if you want. And I consider this my return to blogging! No, this wasn’t supposed to happen! Okay, it’s been a while since I updated, and all those plans I had written about didn’t actually happen. I had every intention of doing it, I just got caught up in life and many other things. First of all, let’s get Authors Answer up to date. It will come out of hiatus later this year, I hope. I’ll also get to work on more international books, writing posts, world building posts, and maybe even a few reviews. And I’m going to talk about a big topic that’s happening to people who have small YouTube channels. And the deadline is tomorrow! If you don’t know what I’m talking about, you’ll see soon enough. Anyway, updates are coming, this was just a little hiccup. Thanks for reading, and I will be posting very, very soon!